Earrings of Arwen - The Pendant of Arwen is a special creation, is complete with chain, made of silver plated, hypoallergenic with Swarovski crystals. 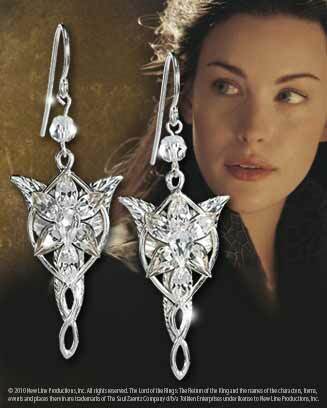 These earrings were designed on the basis of the Evenstar pendant. 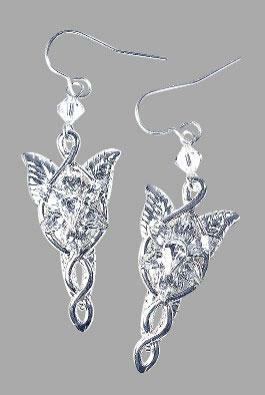 Arwen wet silver earrings hypoallergenic. Total length: (2.16in) 5,5 cm. Pendant Length: (1,37in) 3.5 cm. Only daughter of Elrond, Lord of Rivendal, Arwen is considered the most beautiful beings who live in the middle ground. Born immortal Elf, Arwen chooses to leave this existence without end for the sake of mortal Aragorn. In doing so she condemned herself to die as a human. When Aragorn part to counter the advance of the Dark Lord, Arwen stays with his people, and goes slowly because of his choice, while her father is kneeling beside her, unable to do anything to help her.